There are many different schools of meditation out there, but they all use many similar techniques and processes. Basically, there are two different kinds of meditation that I would call: “esoteric” meditation and “exoteric” meditation. Very simply, “esoteric” meditation are those practices that involve going inward, and focus on what is going on inside of you, while “exoteric” meditation are those practices that focus on what is outside of you. Esoteric meditation practices focus on one’s inner states, and processes like breathing, emotions, thoughts, etc., that lead to higher states of consciousness and awareness. In esoteric meditation, it is important for one to become very receptive. In other words, one has to be able to empty ones’ self of all thoughts, conceptions, and ideas to receive higher spiritual energy. It is like that old Zen story, where a prospective student wants to learn the essence of Zen. He has all these ideas of what it should be like after reading a book or two about Zen. Finally one day, the student goes before the Zen master, requesting to learn about Zen. He tells the Master all the things he has read about Zen and wants to learn. The Zen Master says nothing, but brings out a pot of tea, and asks the student if he would like some. The student does not want to appear ungrateful and accepts the offer for tea. But he continues on with his discourse on his many ideas about Zen. The Master pours the student some tea. Soon the tea has reached the brim of the cup and starts to overflow. The student becomes alarmed, and tells the Master, “Sir, the tea is overflowing!” The Master replies, “It is like your mind, overflowing with thoughts on Zen, but if you are to really learn Zen, you have to empty yourself of all thoughts and ideas of Zen, and be open to the real nature of Zen.” Such is esoteric meditation. One must empty and calm the mind in order to experience higher levels of spiritual consciousness. Exoteric meditation is when the awareness is focused on what is happening outside oneself. Now, one might think that this is our normal state of affairs. Our everyday reality consists of focusing our awareness on what is happening all around us. But exoteric meditation is more than what I call “reactive awareness”, which is our customary consciousness of the world. Exoteric meditation allows one to see or feel the connection that exists, between the inner and outer aspects of ourselves, and the universe around us. 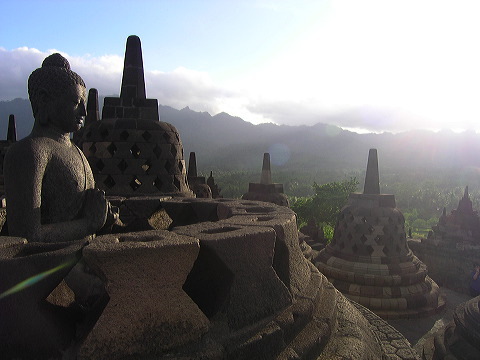 One example of exoteric meditation is the practice of “mindfulness”. This is a Buddhist meditation that focuses the awareness on the present moment. The emphasis of this meditation is to experience fully the present moment, without judgment or apprehension. For most of us; our present reality is always colored with a constant mental dialogue that is filled with apprehension, fear, and judgment. For example, I may be at a meeting for work, and not have paid any attention to a word that was said, because I was preoccupied in a mental dialogue about my next project deadline; or I may have eaten my entire lunch, without tasting one bite of it, because of a pending appointment; or I may feel bored waiting for the clock to strike four o’clock, so I can go home. If you are ever bored, you are not in the present moment! The present moment is always infinitely interesting! An important aspect of mindfulness is acceptance; acceptance of the present moment. If you are stuck in traffic and becoming irritated, you are not in the present moment, as you would rather be somewhere else. This does not mean you have to be happy, because you are stuck in traffic, it means you just have to accept it, and allow things to move at their own pace. Every morning, I have to commute to work and whenever there is a traffic jam, I tend to get upset. I get upset because I am not accepting the present moment, and would rather be moving along the road to my destination. But if I am able to become aware and accept the present moment without judgment, then I can just experience this event; called a “traffic jam” without letting it bother me. Then it becomes an interesting experience instead of a frustrating one. Exoteric meditation is also intense concentration on an object or course of action, where you lose yourself in that object or action. When people who engage in sports say; “they are in the groove”, that is natural exoteric meditation. I have experienced this feeling when I have been on the cutting edge in trail running and cycle racing. It feels like you have hooked into the flow of the universe, and every move you make is natural and perfect. The sense of effort disappears and you are completely at one, with what you are doing. In Zen in the Art of Archery, the goal of the archer is not to hit the target, but to become one with it. At that point the archer, the arrow and the target all become one. Intense concentration on an object is another form of exoteric meditation. In Yantra Yoga; meditation on pictures, symbols and “mandalas” are used to transform one’s awareness to a higher state of consciousness. Within the esoteric arts; there are many exoteric meditative practices where one concentrates on various objects, plants, animals, people and divine god forms. Through meditative techniques, one can experience the object of meditation from the inside out; instead of looking from the outside in. In other words, through meditation, you can experience an object, plant or being from within. In a sense, you actually become that object of meditation. I have spent hours watching geese, birds, squirrels and other animals in the park. I have practiced meditating on them and it is quite fascinating how your perception changes. You actually begin to feel what it is like to walk like a goose, move like a goose, think like a goose and fly like a goose! Our consciousness is not limited to our little mortal bodies, but can move and become wherever we put it. This is the great secret of meditation! Esoteric and exoteric meditations are really just two sides of the same coin. They are just two different approaches to the one universal reality that is part of all of us. The great sage, Hermes Tremegistos said: “As above, so below; as within, so without.” Such is the nature of the One Reality. Whether we seek the divine from within or without, it is there and everywhere. But the interesting thing is that it has to be discovered. We have covered our divinity through our physical bodies and egos manifesting on the physical plane. Meditation is the best way to uncover our real nature and realize inner divinity. I like to combine exo and esoteric meditation with an eye to reducing reactivity to triggers (as approaches like EFT and EMDR work on) but as a form of meditation. I posted a guided meditation if you'd like to try it, with the addition of bilateral sound. I've been meditating for about 35 years (but not straight through!) and am very interested in the psychology involved. Modern Day Mystic blog is a forum for all discussion, thoughts, ideas, events about mysticism and how it relates to our everyday world we live in. We are all here together on this physical plane for a splendid journey. Wake up to the moment! The world is waiting for you! Don't put your happyness off another day. Everything you need to experience the Center of all things is right here, right now! I am a modern day mystic and have written two books on yoga and mysticism. I practice yoga and meditation regularly which helps me to stay sane and appreciate our crazy world.